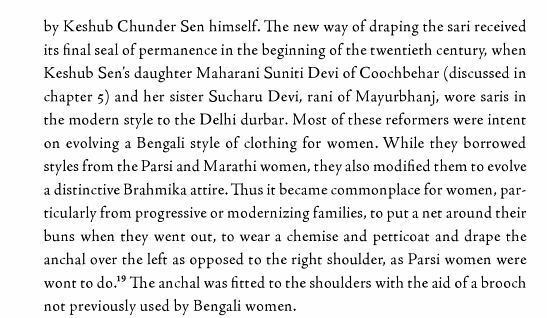 Extract from Marriage and Modernity, Family Values in Colonial Bengal (Rochona Majumdar) indicating that the anchal was eventually draped on the left for the Brahmika saree. This entry was posted in Dress Reform, Early 20th Century, Sari, Sari Blouse, Vintage Blouse and tagged Bengal, Brahmika, dress reform, india, saree blouse, vintage. Bookmark the permalink.